Connect to the heart and soul of Portland! 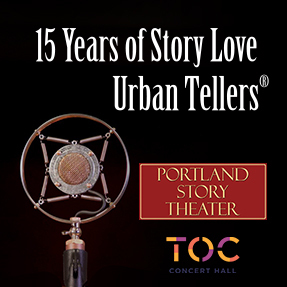 This month, these storytellers: Penny Walter, Victor Bencomo, Karen Lasher, Katie Skurja, Steve Eggerts, and Chalice Stroebe have come together as Urban Tellers® to stand and deliver the real, true stories that they have discovered, crafted, and honed in Portland Story Theater’s Art of Personal Narrative workshops. Told eye to eye, face to face, and heart to heart.